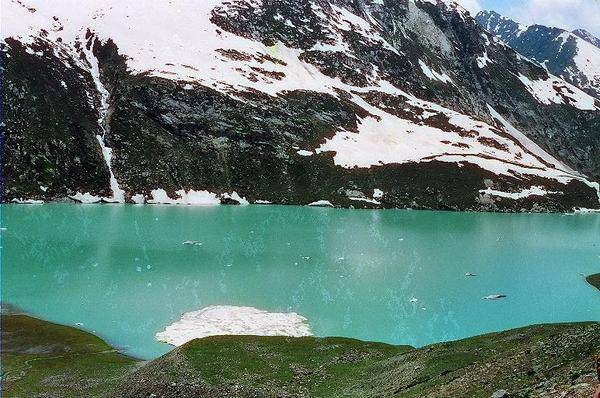 Sheshnag Lake is nestled at an altitude of 3590 meters in the track which leads to Amarnath Cave from Pahalgam. Spreading across some 0.7 km of width and 7 km of length Sheshnag Lake is type of lake where the productivity of algae is very low. Because of this nature, the water of the lake is very clear and clean with a drinking water taste. Also the amount of oxygen is abundant and the lake is very cool, the breeding of trout is much high in this lake. As per Hindu Mythology, Lord Sheshnag (King of Snakes) himself dug this lake. The people of Pahalgam believe that even today Lord Sheshnag resides in this Lake. During winter, the lake freezes and it is tough to access the lake due to heavy snow pour. From Chandanwari, ponies or horses can be hired to ride the rest of the distance to the Lake. Camping can also be done. It is a perfect picnic spot amidst of meadows, snow peaked mountains on the banks of Sheshnag Lake.